NIGHTWHERE Nominated for a Stoker! Free Fiction! SIREN back in Print! NIGHTWHERE is a Bram Stoker Award finalist! 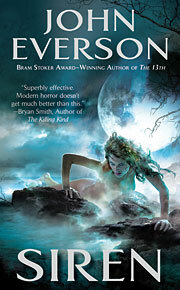 Amazon has reissued SIREN and THE 13TH in trade paperback. Martin Mundt's THE CRAWLING ABATTOIR is FREE on Wednesday from Amazon! 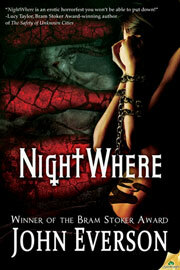 NightWhere is a Bram Stoker Award Finalist! I had just arrived in Santiago, Chile (on a long business trip) two weeks ago when I got the email saying that my sixth novel, NightWhere, was officially a finalist in this year's Bram Stoker Awards. You can see the full awards ballot here. Talk about a great way to start a long trip! This is the first time one of my novels has been on the Bram Stoker Awards ballot since Covenant made it there (and ultimately won) back in 2005. I also had a short story make the ballot in 2008 ("Letting Go" from Needles & Sins), so this is only the 3rd time in 20 years of publishing that my work has gotten that far. Needless to say, I'm pretty excited about this, and I am looking forward to attending the Bram Stoker Awards ceremony in New Orleans in June. Whether the book wins the award or not, it is a really amazing thing to be on the ballot, and I'm really gratified that this novel that I was "afraid to write" for many years, has ended up getting such support and acclaim. For fans of NightWhere (and those of you who've got all my other novels in hardcover) look for a special Limited, Signed Hardcover edition of the novel, coming this spring from Bad Moon Books. I'll post more information about that here when I have it. NightWhere is also going to be translated this year into German from Festa Verlag (who will first be releasing Siren, retitled as Ligiea, this spring) and into Polish from the new Radical Press this summer. Amazon reissues The 13th and Siren in trade paperback! Today, Amazon's 47 North imprint released trade paperback editions of The 13th and Siren! While both books have remained available as e-books for the past couple years, they have been out of actual print since Leisure Books killed its mass market line back in 2010, so I'm excited that they're available in ACTUAL paper again. I'm looking forward to seeing a copy myself! Download a free copy of The Crawling Abattoir. Now! It was at least a decade ago when I first heard Martin Mundt read the story "DWF" from The Crawling Abattoir. My stomach still hurt the next day from the laughing I did the night before. I was privileged to be able to work on the "expanded trade" edition of this bizarre collection of horror humor tales nine years ago, when Twilight Tales turned it from a chapbook to a perfect bound color cover book. I am more privileged now - because my small press, Dark Arts Books, now has the publishing rights to the collection and we've reissued it over the past week, along with its follow-up, The Dark Underbelly of Hymns. 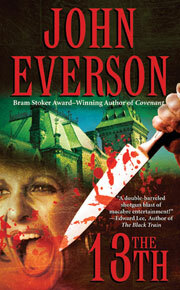 Tomorrow (Wed., March, 13) is the last day you can download The Crawling Abattor for FREE from Amazon. PLEASE DOWNLOAD THIS BOOK NOW! 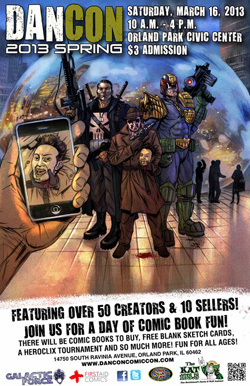 I really want The Crawling Abattoir to do well in its new e-book iteration -- this is a book I've believed in for many years!!!! And for that to happen, we need a lot of people to have downloaded it while it was "on sale" for free! Please go head and download, and then tell your friends. And not to worry - if you don't own a Kindle, you can use the free-downloadable Kindle Appl! So download it today and please tell all your Facebook friends! 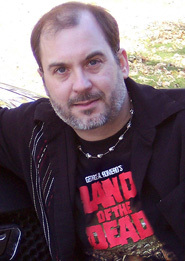 Last year, I hung out with a great group of comic creators at DanCon, at the Orland Park, IL Civic Center. This weekend, I'm doing it again. If you're in the Chicagoland area and have any love of comics, you NEED to come out for this amazing day. It's on Saturday, March 16, from 10 a.m. to 4 p.m. You'll find every comic tie-in you've ever dreamed of there! And I'll be out there as well, selling and signing horror books. How can you lose ;-} ? See you at DanCon on Saturday! So far, Lucky '13 has been pretty lucky. From a fluke double Amazon "promotion" that got my novels Sacrifice, The 13th and Siren much wider distribution in January and February to the reissue of a couple of my novels in trade paperback to the Stoker Nomination for NightWhere... life's been pretty good! Cross your fingers for me that this luck continues! And download The Crawling Abattoir. now :-) this is the best fiction collection I've read in years.... I know you will enjoy it! And it's FREE for 26 more hours!